Appelwood Bed and Breakfast, WV -Welcome! 100 year old recycled timbers joined with newly cut wood; old fashioned construction techniques used to create a modern open design. Perched atop the second highest peak in Monongalia County, Appelwood affords it visitors a spectacular view of the surrounding countryside. The house, originally built in 1978 for Dr. John Coyner, is a classic post and beam design by John Garlow, a brilliant builder from Morgantown. The main house, consisting of 3512 square feet of living space, is built primarily of oak and chestnut timbers which are exposed to the outside on the front and west wall; the chestnut timbers used here are over 100 years old. Recycled timbers are typical of post and beam construction and are especially effective since they are already aged and therefore impervious to warping or significant shrinkage due to weather and time. The chestnut timbers on the front wall were recycled from the old home place on the Huff farm near Mannington (grandfather of Sam Huff, NFL Hall of Famer and one time WVU linebacker). The main frame of the house is made up of forty tons of new oak. And, believe it or not, all of this is held together without the use of bolts or screws. The massive stone fireplace in the living room has an opening over six feet high and eight feet wide. It has a triple operating damper that works beautifully for a small or large fires. The fireplace is adequately large enough to roast pigs and has actually been used for that purpose on occasion! The mantelpiece is an eight inch by twelve inch, twenty foot long piece of walnut which was cut on the property and milled nearby. All stonework in the house was done by Bob Lewis, a well-known mason from the Fairmont area. The entire west wall of the great room is glass with antique wormy chestnut paneling and 100-year-old chestnut beams. The ceiling in the living room area is 2 1/2 inch thick redwood from an old silo in Cloverleaf, WV. The radial oak floor was laid by John Garlow and came from the Mongold Lumber Company near Elkins. The solid oak antique doors on the lower level came from Dr. Carter's mansion in Fairmont. The front and back entrance doors are also antique wormy chestnut and were designed and created by Charles Matala, a noted woodworker in the Morgantown area. The door to the entrance foyer is over four inches thick. It is handmade and fully insulated with one inch thick cherry paneling on the inside. The hardware on the door and in the fireplace were made by a decorative blacksmith following a design drawn by Angie Coyner. The entrance foyer is tiled with brick from an old pottery factory in Mannington, WV, and paneled with West Virginia cherry. Appearing directly in front of you as you enter the foyer from the outside is a custom made tiffany reproduction stained glass window. The vertical post in the great room are solid walnut and solid cherry. The walnut posts are new timber, fashioned from trees cut on the property during construction. While, the cherry posts are 100 year old timber, recycled from an old barn near Morgantown. 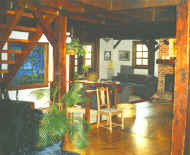 The custom-made casement-type windows on the kitchen end of the great room are framed almost completely from recycled barn timbers; these and the bay windows on the front of the house were designed and created by Charles Matala. The ceiling in the kitchen is antique oak. The kitchen cabinets, made entirely of solid cherry, were built by Mike Dilletose of the Grafton area, an excellent cabinetmaker. Particularly interesting in these cabinets are the hidden shelves accessed by swinging the front area forward and to the left. The lower level is accessed via a unique spiral staircase. The stair design, also by Mike Dilletose, represents an open spiral with no center supports. The individual runners are fashioned from three and four inch oak planks that appear to suspend themselves. This lower level is also where the two reservable rooms are located. The floors on this level, where not carpeted, are solid cherry. The Massage room and sauna are paneled in redwood, sawed by Mongold Lumber Company from wood trucked in from California. The Massage room opens into a ten by fourteen foot solarium that is fully temperature controlled with heat, light, and exhaust fans automatically operated via thermostat. 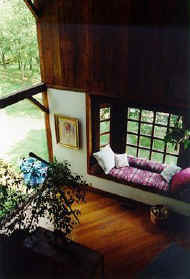 The floors in the private living quarters, found on the third level, are solid oak and the walls are solid walnut. The expansive glass wall in the east end of the living quarters has a view of the Cumberland area, and affords a beautiful sunrise view. The large windows in this room and the Celestial windows are one inch thick with two 1/4 inch plates of glass in an inner space. The fixed glass is tinted bronze for sunlight reflection. The large deck in the rear of the house is solid oak and cedar. The breezeway is oak and hickory. The main house is adjoined by a large two story structure featuring a two car garage, heated and air conditioned workshop on the ground floor, and a one bedroom suite above with bath, kitchen and living room. The guest house is appointed with walnut cabinets, exposed post and beam construction, heat pump and air conditioning.